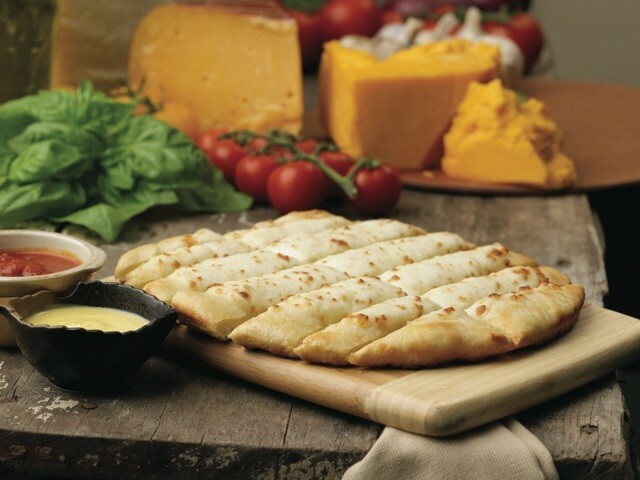 Our homemade, thick dough smothered with mozzarella cheese. Served with garlic butter and marinara sauce. Toasted Italian bread brushed with garlic butter & Italian seasonings. Garlic bread layered with provolone & cheddar cheese. Served with warm marinara sauce. A generous portion of fries, baked & seasoned to perfection, topped with melted mozzarella, cheddar cheese & bacon. Served with a side of creamy ranch dressing. Four large meatballs baked to perfection, topped with marinara sauce and freshly shredded mozzarella. Served with hot garlic bread. Presented on a crispy crust brushed with olive oil, covered with spinach, basil, freah garlic, feta & mozzarella cheese, tomatoes and sprinkled with a parmesan and oregano blend. Tender, juicy wings served flaming hot or smoky barbeque with your choice of creamy ranch or chunky bleu cheese dressing. Tender, juicy, all-white-meat chicken bites. Enjoy them plain or shaken in our hot or barbeque sauce. Served with your choice of creamy ranch or chunky bleu cheese dressing.